The Whittley CR2080 is one of a dwindling family: the Australian-built fibreglass trailer boat. This brand, though, seems to be here to stay, winning awards and staying at healthy levels of production. Within its hull length of 5.3 metres it packs a lot of ability. The CR in the Whitley’s name nominates it as a cruiser, and it can actually be used as one. 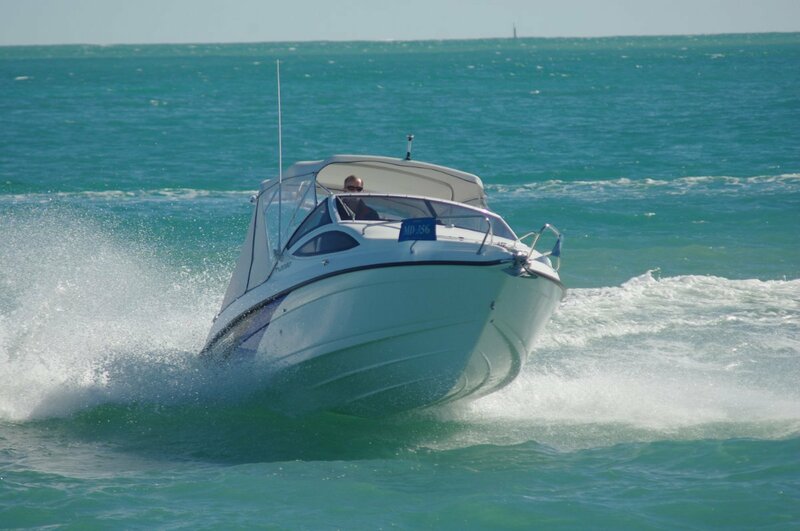 In WA the term cruiser, applied to trailer boats, usually implies a day boat used for something other than fishing. The 2080, though, can handle overnights, and is also no slouch in the fishing department. A key component is the full set of camping covers, which can be stripped back to Bimini size for daytime. The cabin they make is far from claustrophobic and is capable of accepting an air mattress. This area also contains a few aids to civilisation. Tilting the driver’s seat reveals a sink, connected to a 43 litre tank. Under the offsider’s seat is a cutting board and what could be a shallow ice box or a bait container for another day. The seat backs swivel to the side to let the lifting happen, which also lets the seats be used in reverse as fishing perches – or simply to face the occupants of the quarter seats. These are alongside a sterndrive engine: a 200hp V6 Volvo. Its V layout makes its intrusion into the people space not a lot more than the splash well of an outboard. The motor box’s padded top makes a great aft facing seat; its footrest is the full beam swim board-sterndrive protector. The cabin has a partial rear bulkhead, which means there is plenty of area in front of the driver to carry dials, electronics and switches. Among these is a gorgeous clutch of analogue engine gauges. Needles are far quicker to read than digital (think wrist watches). You can set them in place so that for all critical readings the needles point straight up. There is a trace of bulkhead ahead of the navigator; enough to carry an oddments tray and a net storage bag – these are great for confining stuff that would otherwise rattle. The cabin itself is on the small side – understandable in a boat only a shade longer than an imperial 17ft. Sitting headroom is available only at the after end. On the other hand there is just enough length to make the bunks sleepable, especially with the infills in place, and more especially if the sleepers are children. For daytime, abundant light comes through the fore hatch, side windows and the missing bits of bulkhead. The space is lined and, in a quality touch, so are the under bunk storage spaces. These plus the side pockets and caves below the installations under the main seats give enough storage for weekend jaunts. The deck hardware is business class. There are cleats at the shoulders, exactly where most boats want but do not have them; the anchor retaining metalwork is a symphony of practicality and tidiness. In fact the whole foredeck execution, design and moulding, is very well done. The day’s weather featured a moderate swell mixed with a fierce offshore breeze – the kind of wind to create short, steep seas that do nothing at all for comfort. In the interests of scientific enquiry we gave it handfuls of throttle to see how this modest sized boat coped. Very well, was the answer. Possibly a centre of gravity a little farther forward than an outboard would have had helped with this. We certainly had the presence on the water of a bigger boat. Minute adjustments of power trim (always an indicator of a well tuned boat) set us up for seas from different angles. Under family circumstances we either would not have been out there or we would have eased off, but the 2080 coped well with acceptable ride quality. Overall the Whittley 2080 fitted its role well as a pocket cruiser-all rounder, and at a price - $73,750 – that seems in tune with what you get.